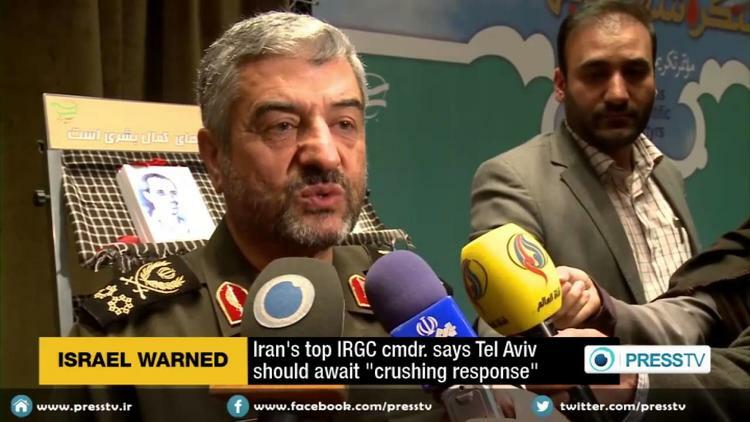 The commander of Iran’s Revolutionary Guards (IRGC) warned on January 20 that Israel should expect “devastating thunderbolts” in response to the January 18 air strike in Syria that killed an IRGC general and several members of the Lebanese Hizballah militia. Iran has said that Brigadier General Mohammad Ali Allahdadi who was killed in the bombing in the Quneitra region of southern Syria, was giving “crucial advice” to Syrians fighting terrorists — a reference to Sunni rebels and Islamic extremists. The strike also killed Jihad Mughniyeh, a field commander and the son of top Hizballah operative Imad Mughniyeh, who was assassinated in 2008 in Damascus. Israel was believed to have been behind his assassination. Both men reportedly had ties with Iran. Khamenei.ir, the website of the Center for Preserving and Publishing the work of Iran’s Supreme Leader, posted two pictures of Jihad Mughniyeh with Khamenei, including one where the two men are embracing each other. Israel has not confirmed that it carried out the air strike. However, the Reuters news agency quoted an unidentified Israeli source as saying that the IRGC commander was not the intended target of the attack, and Israel believed it was attacking only low-ranking guerrillas. The news agency said the comments appeared aimed at containing any escalation with Iran or the Lebanese Hizballah guerrilla group. Iran supports the Syrian regime and the Lebanese Hizballah through military and financial means. Allahdadi is believed to be the second senior IRGC commander killed in Syria. In February 2013, IRGC commander Hassan Shateri, was killed while traveling from Damascus to Beirut. Iranian officials blamed the death of Shateri, a veteran of the Iran-Iraq war, on “mercenaries and supporters of the Zionist regime” while vowing revenge.